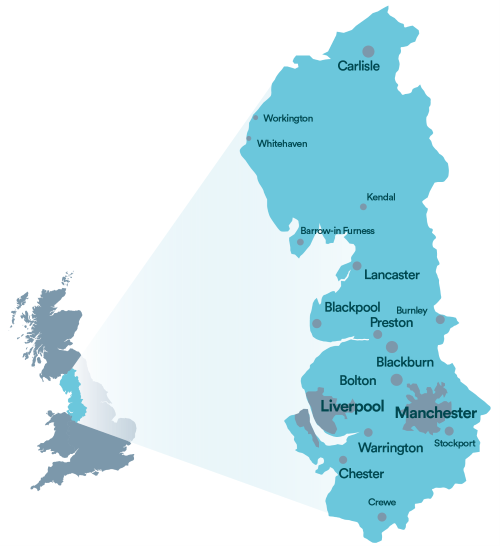 From Crewe to Carlisle, our offices plus water and wastewater treatment works span the North West of England. We gather our water from a range of different sources, but predominantly from our reservoirs in the Pennines and the Lake District. We extract water from Lake Vyrnwy in Wales for customers in Merseyside and Cheshire, while the rest is taken from the River Dee, boreholes and streams. Of the 1,700 million litres we supply every day, well over half is from Cumbria and Wales. The two biggest reservoirs are Thirlmere and Haweswater in Cumbria. Haweswater holds more than 84,800 million litres of water – equivalent to around 33,900 Olympic swimming pools. We own and manage over 56,000 hectares of land, making us the largest corporate landowner in England. Much of this is catchment land (the areas immediately surrounding our reservoirs). We recognise that quality control starts right at the point of collection, so we keep our catchment land as clean and sustainable as we can. This helps with the water quality for our customers and makes a huge difference to the environment. Supplying great water to homes and businesses, removing and treating wastewater behind the scenes. Developing our infrastructure in response to climate, population and lifestyle changes so we can deliver a service customers can rely on now and in the future. Responding to changes in customer behaviours so we are easy to do business with by phone, web or app. Delivering value for money through improved efficiency. Using new technologies and thinking from outside the water industry to find sustainable cost effective solutions. Supporting customers who have additional needs and are struggling to pay. Protecting and enhancing the natural environment in the North West in the way we deliver our services. Supporting local communities through partnerships and employee contribution. Supporting employees in a safe workplace and investing in their learning and development. Customer focus – Everything that we do will be about our customers, not us. Integrity – We will make promises knowingly and then keep them. Innovation – We will find new ways to make our services better, safer, faster and cheaper for our customers. Everything you need to know is on our corporate website.